“vocalese” was first used by noted jazz critic Leonard Feather in a 1959 article in Jazz: A Quarterly of American Music to describe the art of melding new lyrics to the frame of classic jazz instrumentals. They multi-tracked the songs with Annie Ross because the chorus couldn’t swing. Thus was formed LH&R in 1958. 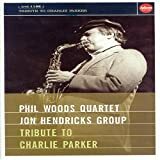 Their repertoire included Hendricks’ lyrics to three Horace Silver tunes, Randy Weston’s “Little Niles,” Cannonball Adderley’s “Sermonette,” Clifford Brown’s “Joy Spring,” and Dizzy Gillespie’s “Night in Tunisia” (on which Frank Paparelli collaborated). 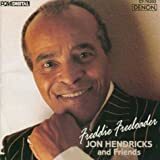 His successful 1990 recording, Freddie the Freeloader, included several other fine jazz musicians. In the film White Men Can’t Jump (1992) he is featured in an a cappella group. He and Annie Ross paired up in the late ‘90s for a two-year tour. Currently Hendricks, known as the “James Joyce of Jive,” is teaching at the University of Toledo in his hometown.